Can We Calm America’s Road Rage? Road rage – where flaring tempers mix with two-ton machines – continues to be a problem on America’s highways, leading to accidents, assaults and occasionally even murder. It’s a perplexing problem in part because it can happen at anytime and anywhere that roads and vehicles are involved, yet specific statistics on its frequency are hard to come by. All that aside, though, there are solutions that can at least reduce the number of road-rage incidents. People who are easily angered by slower drivers, detours and other traffic disruptions can be taught to be more aware of their responses and modify them to reduce accident risks, according to research published this year by the Society for Risk Analysis. That let’s-calm-down approach is applauded by Scott Morofsky, author of the books “The Daily Breath: Transform Your Life One Breath at a Time” and “Wellativity: In-Powering Wellness Through Communication” (www.Wellativity.com). “Sometimes there’s this tendency to throw on the brakes when someone is tailgating us, or use an obscene gesture at an aggressive driver,” says Morofsky, who developed the concept of Wellativity, which helps people address any behavior that inhibits wellness. 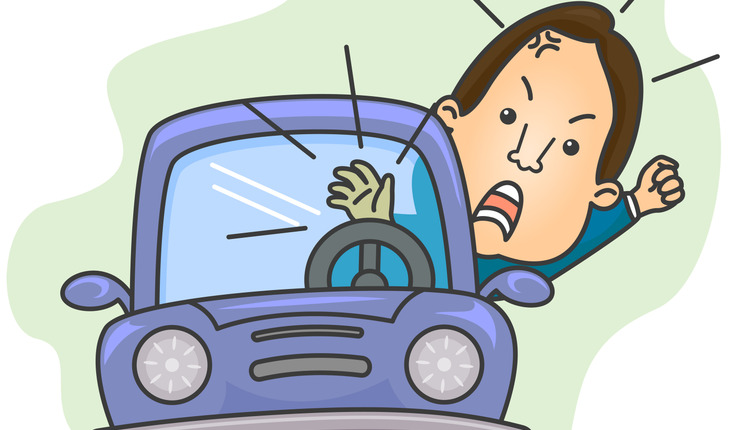 What are some of our behaviors that can aggravate other drivers? The No. 1 culprit is drivers who are texting, according to a 2015 Road Rage Report by Expedia.com, the travel site. Those texting drivers upset 26 percent of us. Other offenders, in descending order, are tailgaters, left-lane hogs, slow drivers and drivers multi-tasking. Of course, those examples represent situations that can raise your ire after you are behind the wheel. Often, the foundation for fury on the highway was laid before you got into the car. Maybe you had an argument with someone earlier. Maybe you are stressed because you are running late for an appointment. • Don’t turn that ignition. If you are feeling stressed and anxious before you even start your trip, then the time to calm down is now, not after you are on the highway. Get a grip before you start the car, Morofsky says. Take that deep breath you always heard would work. You might even try counting from one to 10, inhaling on one, exhaling on two, up to 10 and back to one again. “You want to be relaxed before you head out,” he says. • Don’t react or retaliate. You can’t control those other drivers, but you can control how you react to them. If someone is tailgating you, flipped you off or is just infuriating you with bad driving habits, ignore them, Morofsky says. Engaging in some sort of road-rage argument will just further raise your blood pressure, and could prove dangerous in some circumstances. This is just one more opportunity to take that deep breath, he says. Scott Morofsky is the author of the books “The Daily Breath: Transform Your Life One Breath at a Time” and “Wellativity: In-Powering Wellness Through Communication” (www.wellativity.com). Morofsky created the concept of Wellativity, which uses 12 principles to target crossover afflictions such as obesity, smoking, lethargy, procrastination and any behavior that inhibits wellness. He has national certification as a personal trainer by the American Council on Exercise and various other certifications in the health and fitness field. He is a New York State licensed massage therapist and a graduate of the Swedish Institute of Massage and Allied Health Sciences. For more than 30 years, Morofsky has maintained a private practice specializing in joint replacement rehabilitation and physical training for seniors, as well as fitness training and massage therapy, and has given lectures and taught seminars on these subjects.